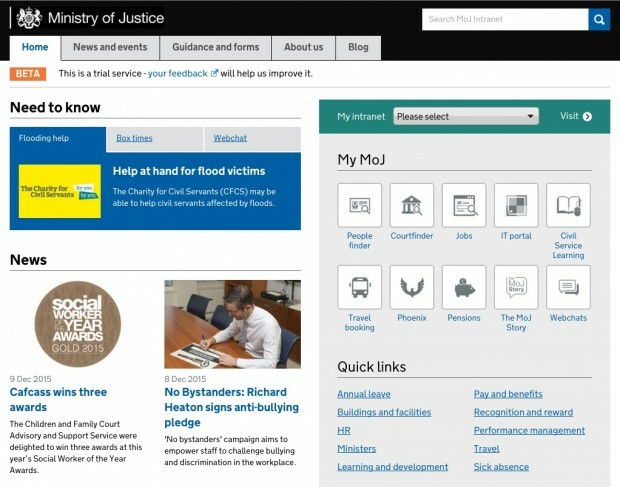 A year ago, as part of improving the Ministry of Justice from the inside out, we talked to you about the relaunch of the department’s intranet. 1,200 content pages later, it’s just been launched. Built using WordPress, it’s now in public beta after a full traffic switch from the old to the new site. Most of our users are pleased with the simpler, faster, sharper experience. Define your minimum viable product (MVP) and keep it minimal. Otherwise, the competing needs of the various end user groups and stakeholders will pull your MVP out of shape. This impacts on your time and resource and is an unnecessary distraction. Example: our MVP factored in a content rewrite of 50 pages which became 200 pages which then became a re-write of 80% of the whole intranet. The intranet is a complex and unwieldy system, not an end-to-end transactional service. So we needed to define what we were dealing with and what the success criteria were. The team agreed with stakeholders how success would be measured, how often and who was responsible for the measuring. Example: we mostly used continuous measurements and also base-lined that day’s performance so we had a starting point. Then we tracked and reported progress. Failing is fine, when you learn from it, do it early and it’s cheap. Take small risks, so if you fail, it’s easy to start again. Example: when we looked at the design of intranet search filters on the search results landing page, research sessions with paper prototypes told us that end users preferred a particular version of the page design. After building the page, however, the next feedback showed initial findings no longer applied but we could revisit and tweak the layout to respond easily and quickly. Right at the start, you need to know who they are and how they’ll contribute. Set and manage stakeholder expectations, and work closely with them so they’re part of the process. Allow them full visibility and an opportunity to contribute – it makes buy-in much easier. Example: if they’re unfamiliar with agile, involve them in daily stand ups and review meetings. Have weekly catch-ups. Invite them to listen to your user research findings to see how this translates into short and long-term priorities. Our stakeholders relocated and sat with us which contributed to an improved and productive relationship. Having fulfilled the short-term project goals, end users now benefit from the updated look and feel of the site, as well as simplified, clearly presented and up-to-date content. And now users can browse and find desired information in less than 4 clicks. It’s far, far, far, far easier to find things. 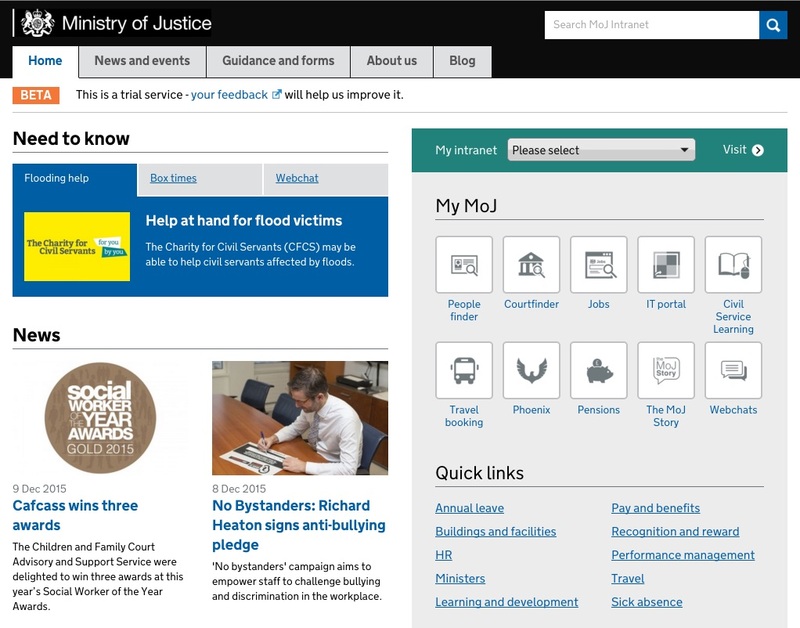 I love the 'My MoJ' section. Simple access to anything we need – brilliant. Much faster to locate articles and the quick links are excellent. We’re continuing to make the new site as interactive and user-friendly as possible and want it to become a hive of staff activity and communication. 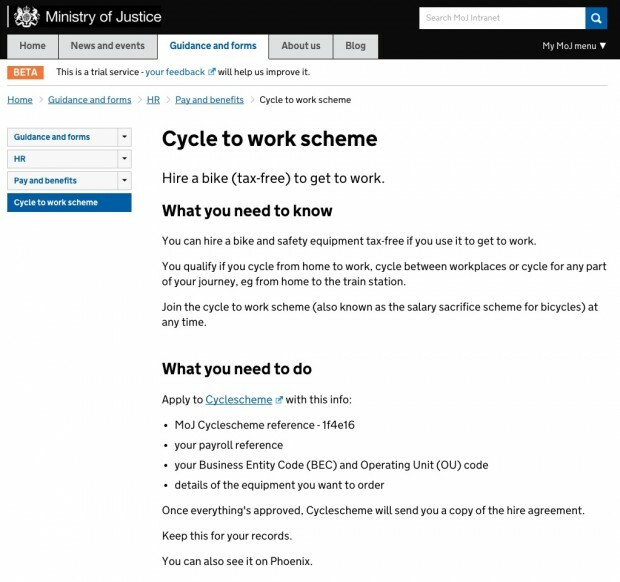 We’re also concentrating on having one intranet platform for the whole department (and all its affiliated organisations), hopefully saving up to an estimated £900,000 per annum. If you’re working on something similar, we’d like to help you so please get in touch. 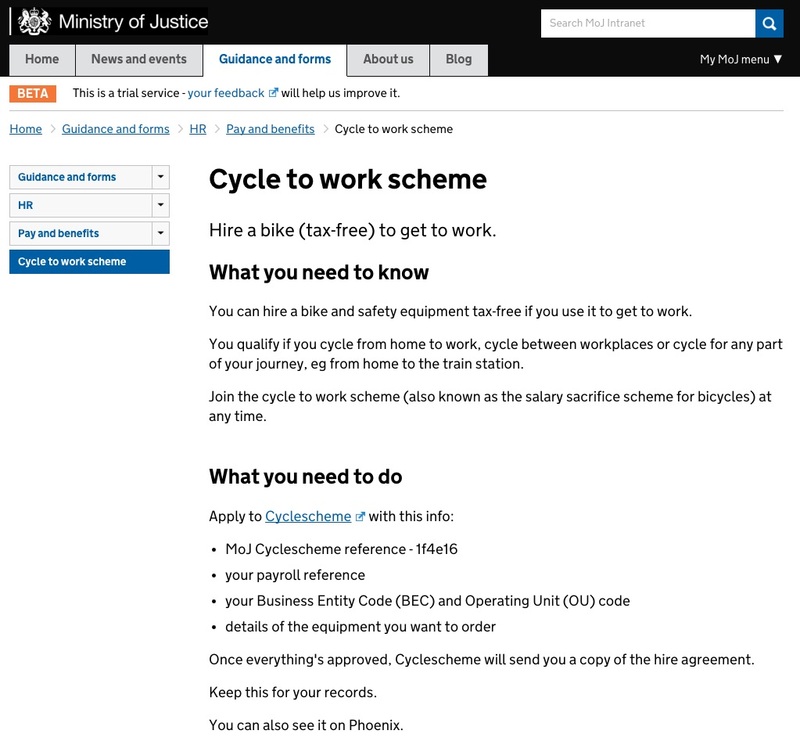 That looks far better than my department's intranet, which is just a mess. Well done!